The Managing Director of Ontario Oil and Gas Limited, Mrs. Ada Ugo-Ngali, fainted on Friday at the Lagos State High Court in Ikeja after being convicted of N754m oil subsidy scam by the court. Ugo-Ngali, who had stood in the dock while Justice Lateefa Okunnu was delivering judgment in a N1.9bn subsidy scam trial in which she and three others where defendants. She slumped as the judge was about to pronounce the sentence. The prosecuting counsel for the Economic and Financial Crimes Commission, Mr. Rotimi Jacobs (SAN), had pointed out to the judge that the offence carried a seven-year jail term and urged the judge to impose the maximum sentence. But before the judge could pronounce the sentence, Ugo-Ngali passed out. As the lawyers in court and her loved ones rushed to aid, Justice Okunnu, noting the state of things, adjourned the case and reserved her pronouncement on the sentence till January 16. As she regained consciousness, Ugo-Ngali was panting loudly while her lawyers frantically called for medical personnel and an ambulance to take her to the hospital. The convict was eventually carried out of the courtroom by her lawyers and loved ones into a waiting black jeep which sped out of the court premises. Ontario Oil and Gas Limited; its Chairman, Mr. Walter Wagbatsoma; Ngo-Ngali; and an official of the Petroleum Products Price and Regulatory Agency, Mr. Babafemi Fakuade, had been arraigned by the EFCC on August 1, 2013. 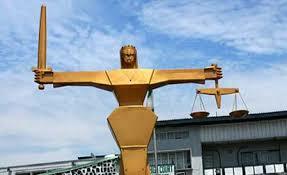 The EFCC, in the eight counts pressed against them, alleged that they were involved in a N1.9bn fuel subsidy scam. The charges centred on conspiracy, obtaining property by false pretences, forgery and uttering. Pronouncing her judge on Friday, Justice Okunnu found Wagbatsoma and Ngo-Ngali guilty, holding that they defrauded the Federal Government to the tune of N754m in oil subsidy transactions totalling N1.7bn. The judge, however, discharged and acquitted Fakuade, holding the charge of forgery brought against him was not sustainable. “The case against the third defendant is that he helped in forging the Shore Quality Certificate; what I see before me is that he only signed the document while acting in his capacity as an PPRA official. “It is not right in criminal cases to infer guilt without concrete evidence, there is no proof that he was aware that the documents were false. “The prosecution have not been able to prove the case of forgery against the third defendant,” Justice Okunnu held, freeing Fakuade. In finding Wagbatsoma and Ngo-Ngali guilty, the judge held, “The defendants defrauded the Federal Government of N340m in the third quarter of 2010 and N414m in the fourth quarter of 2010. “According to a forensic audit by Akintola Williams Delloitte, the defendants did not remit an excess of N754million to the Federal Government. “The first defendant knowingly received the sum in excess of what the fourth defendant (Ontario Oil and Gas Limited) was entitled to. After pronouncing his client guilty, Ngo-Ngali’s lawyer, Mr. E.D. Onyeke urged Justice Okunnu to temper justice with mercy. “The second defendant has health challenges, in the course of the trial she has had cause to visit doctors abroad to take care of her health issues as the health care system in Nigeria is poor. “As the MD, she is an employer of labour whose workers depend on her managerial abilities, her workers will suffer more than necessary especially in this period of recession,” Onyeke pleaded. “It is our humble plea that court grants her a custodial sentence starting from the day she was arraigned,” he added. Responding, however, the prosecutor, Jacobs, said, “The minimum sentence of the offences which the convicts have been convicted is seven years. “A custodial sentence will be sending a wrong signal to the public that the rich cannot go to prison and will be a hindrance to our fight against corruption.